Buffett Center visiting scholar Nabeel Khoury, right, and former Pentagon official Michael Rubin discuss U.S. policy in the Middle East on Tuesday. Northwestern’s chapter of The Alexander Hamilton Society and the American Enterprise Institute on Campus hosted the event. A former Pentagon official and a visiting scholar debated on Tuesday the successes and failures of U.S. foreign policy in the Middle East as part of an event hosted by different campus groups. Michael Rubin, a resident scholar of the American Enterprise Institute, and Nabeel Khoury, a senior fellow for Middle East and National Security at the Chicago Council on Global Affairs, discussed national security, addressing issues in the Obama administration’s strategy and overall goals. 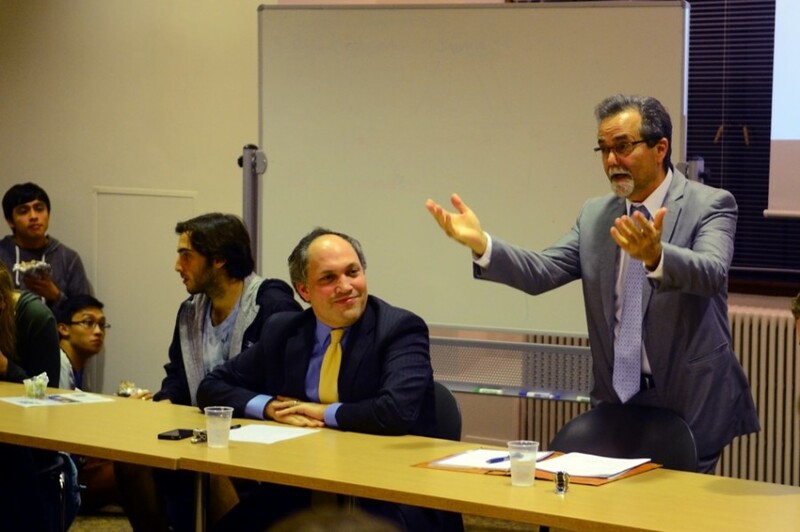 The event, held in Scott Hall, was organized by Northwestern’s chapter of The Alexander Hamilton Society, a nonpartisan group that encourages debate on foreign policy, and AEI on Campus, the student branch of a conservative think tank. About 50 people attended the talk. Khoury then discussed the role that promoting democracy has played in American policy-making in recent years. Khoury pointed to the Bush administration’s strategy of promoting democracy in one nation with the hope that it would spread throughout a region. However, he said this idea is flawed because it has the potential to advance religious extremism. Rubin was more critical of U.S. foreign policy and its strategies, saying they tend to focus on grievances rather than ideology. He gave the example of former Iraqi Prime Minister Nouri al-Maliki and said simply addressing the complaints of terrorist organization ISIS would have been futile for achieving peace. “We have a separation of church and state, but that doesn’t mean we can rule religion out of every policy,” Rubin said. In response to Rubin’s comments on grievances versus ideology, Khoury said the view of Middle Eastern ideology popularized by pundits and politicians is inaccurate. Rubin also argued the biggest difference between the political left and right is on the topic of national security. He said while the left tends to “demonize” power, the right recognizes that the use of military force is sometimes necessary. Rubin ended his remarks with suggestions for U.S. policy in the future. The U.S. should envision what they want policy to look like in a decade and move backward, he said. He added the U.S. needs to understand history in order to better grasp foreign issues. Weinberg senior Wilson Shirley, who helped organized the event, said he first met Rubin in Washington, D.C. and became interested in bringing him to campus.